It's been a while for sure. I think about my blog every once in a while but the lack of exciting news in my life seems to keep me from writing a post. Plus, one of the main reasons for this blog was to keep my mother up-to-date with my life so that she wouldn't call me with a million questions. She isn't able to read now so the motivation is gone. Living with my mother was harder than I expected. There was no way to keep her happy. At the end of June, she agreed to move-in to an assisted living place because she didn't like being alone all day while I was at work. We moved her there. The weather was so hot and my nephew and I moved her stuff there ourselves. It was a nice one bedroom apartment which opened to a shaded courtyard. She hated it and they said they couldn't keep her. I think she was there a whole 10 days. I brought her back to the house for a week while I looked for a memory care place closer to home. The cost was a lot more, $5,000 compared to $2,800, but at least she couldn't walk out. The new place moved her stuff for us. I was so happy about that. She hated it there too and called me many times a day to tell me but I couldn't bring her back to the house. She wasn't able to live without supervision anymore. People try to be helpful and say couldn't you just hire someone to stay with her while you are at work? I could, but I could not mentally stand it. She didn't know what time it was. Knocked on my bedroom door at all times of day and night. Moved stuff around so that I couldn't find things. Wanted to drive the car. Walked out the door. Complained of all sorts of illnesses and issues from wetting the bed to not liking her shoes. Wrapped up food, trash, soiled clothes and hid them until they molded and smelled. Poured oil on the stove. Turned the A/C up when she was cold (yes, it gets colder). Thinks people are stealing from her and breaking in to the house. I could go on and on but anyone who has experience with dementia knows what I'm talking about. I did find a special programmable phone for her after she called 911 ten times at her new place. Instead of single numbers the buttons only call preset people. I'm glad someone invented that because I didn't want her to be totally cut-off from communication. Unfortunately, she can't remember how to work the TV or her computer anymore and she can't read well so she is bored most of the time. If you want to rile her up just say the word "Bingo". She hates it. I spent about 6 hours with her on Sundays, took her to church and shopping or out to eat. It was getting more difficult though because last time she refused to get out of the car when we got back and before that she grabbed on to my arm and wouldn't let me leave. I would have visited her more if she was more amicable. In the middle of this moving from one assisted living apartment to another, Jimmy-dog suddenly became ill with diarrhea and vomiting. I took him to the vet and they tried to help him but he died at home the next day. I think his tumor finally interfered with something important. I miss him. With mother out of the house and Jimmy-dog gone, I tried fostering again. 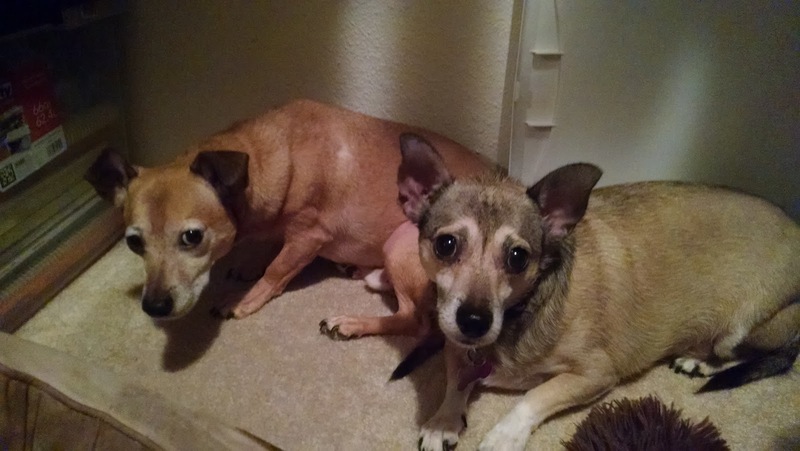 I took in two chihuahuas after a local shelter had flood damage. It was only supposed to be for a month but it stretched into 3 months and I finally returned them. The two chihuahuas were very scared and I was hoping they would like me and relax here but they stayed in the closet and only came out to pee on my stuff. I had to put up a puppy gate in front of the closet to keep them in while I was at work. I also tried to foster a larger dog but that was a disaster. I picked out a dog that was on the euthanasia list. He was black and tan like Jimmy-dog and I thought maybe I could adopt him if he fit in. Well, someone else wanted him so the rescue suggested that I get another dog. This is where I should have said NO but he was going to die and I thought, maybe, he was a pit bull mix, not one I would have picked, but his evaluation just said he was a little shy so I drove an hour and a half to get him. Then, I volunteered (I must have really been feeling energetic that day) to transport another larger dog at the same time. I thought I would just drop the other dog off but as I was driving back the rescue called and said they couldn't get ahold of the person who was going to foster the larger dog, then, when they realized the dog wasn't neutered they asked if I could drop him off at the vet in the morning. I said ok, one night wouldn't hurt. 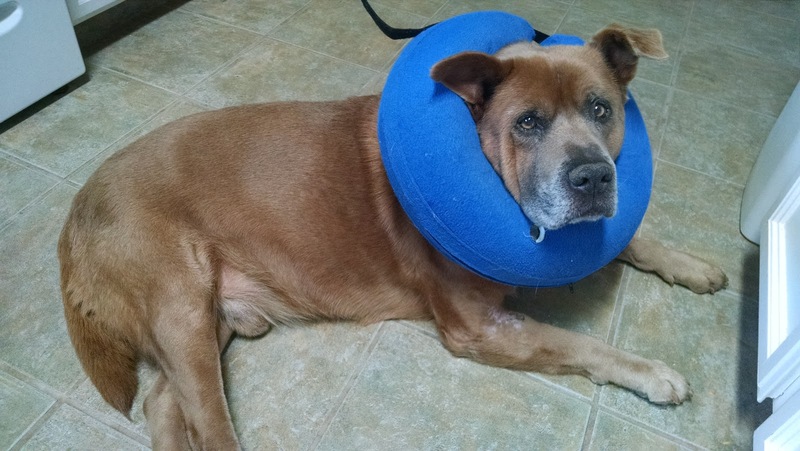 So I dropped him off the next day and then they asked if I could keep him for a week while he heals from surgery because the other foster home had a pool and they didn't want the incision to get wet. I reluctantly agreed. These two new dogs quickly became more than I could handle. They were both around 4 years old and very strong. The one I was supposed to foster was not house trained and my bedroom became a disaster area. My terrier did not like either one of the big dogs and let them know it. He got bitten 3 times in the head, the last time he was bitten I ended up crying to the rescue that I just couldn't do it. I felt like a failure but I had to protect my dog. Things got out of hand so quickly. By the end of the week I was taking my terrier to work with me every day and we were hiding out in the guest room at night because the foster dogs would whine and scratch at the door for hours but I couldn't trust them around my terrier. 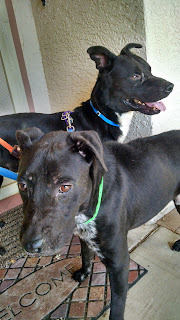 Finally on Saturday I took the larger dog to his new foster home and the smaller (50 pound) dog had to go to a boarding facility until they could find a new foster. I paid for his boarding so the rescue wasn't really inconvenienced and they found him a new foster home 2 weeks later. Later on my dog's head got infected and he needed half of a face lift to close the wound. I will spare you the Frankenstein picture. I thought he had only been scratched but it was actually a puncture wound. Around the end of September, my mother fell. When I went to visit her, she was in a wheelchair and now had to wear diapers. No one could explain why she suddenly couldn't walk and she could barely say coherent words. I thought she might get better but the doctor at the facility just gave her more sedatives and anti-anxiety meds. 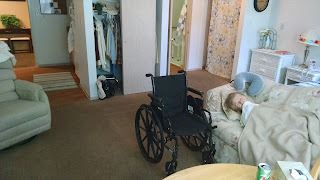 She fell out of bed and her wheelchair many more times. Finally, I took her to a previously scheduled neurology appointment with a doctor she had seen back in April. He was appalled by her condition and told me to take her to the ER for a complete work-up. We spent the next couple of days at the hospital while the very young doctors tried to diagnose her. What we did find out was that she had a broken pelvis from a previous fall and extra fluid on her brain. There was ultimately nothing they could do for her that wasn't invasive surgery. We didn't think she would survive another surgery so I took her back to the care-home. My sister came out to visit and we went to look at a smaller group home where we thought she would get better care and attention. We moved her there and that is where she is now. The hospice people come and visit her and make sure that she is getting good care. They got her a hospital bed with an air mattress and a wheelchair. Her condition is about the same. Some days she sleeps a lot and some days she is awake and trying to stand up. She is still close by and I try to visit her 3 times a week. Lately, I think she recognizes me but I never know if she will or not. And back to the dog situation. My other sister came out to visit for Christmas and we went dog-shopping at the pound. I was looking for an old mellow dog, preferably female. Well, I found this old guy. He was sleeping and didn't seem to care about the barking around him. 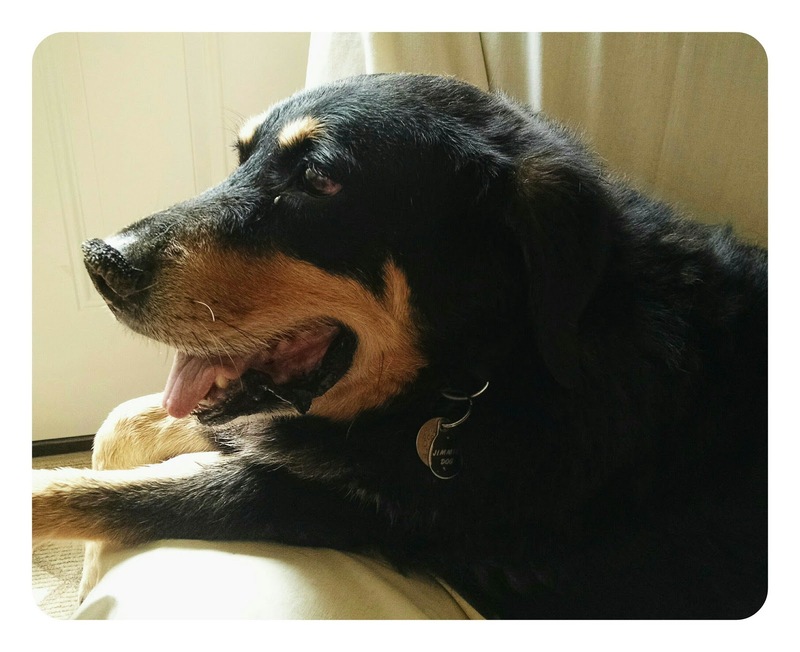 He is 14 years old according to his previous owners, 75lb. pit-chow mix, and arthritic. I brought my terrier to meet him and it went well so I brought him home. I know he won't be around for very long but I'm glad I can give him a comfortable bed and good food while he's here. He has a soft cone on so that he doesn't lick his leg where he had a lump removed. 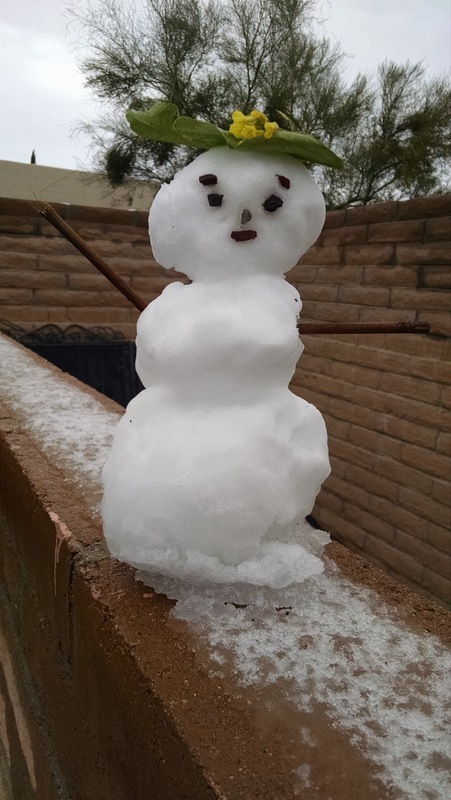 One last photo of the Arizona snowman made from the 3 whole inches of snow week got the first week of January. Goodness you have been through a difficult time. You are such a good person to have done all that for your mother. Thanks for the update. I am glad you are still moving forward! and am glad you were able to find a good place for your mom. I am impressed with your courage, in spite of the challenges! Good things will come again! Ah, Daizy, so glad you’re back. With a ton of, if not exciting, exhausting news. Your mum has an exceptional daughter. In the middle of it all, you’re still going to work. I hope things settle down for your household of three. What are the names of your terrier and the new sweet-looking pit-chow? I’ve been wondering how things were since you hadn’t posted. (I’m a longtime reader but rarely comment.) I’m so sorry about Jimmy-dog, and I think you did the right thing with the other dogs. Your new dog looks like a sweetheart! I hope things go better with your mom as well. Good for you for recognizing when things were too much and getting your mom alternate care. @George G, thanks, I have tried. I wish it had been easier to make her happy. Nowadays though, a smile and a cookie makes her happy so at least I feel like I'm doing something for her when I visit. @JB, thanks for the encouragement. It's been educational for sure. Maybe I can use my new found knowledge to give advice to my neighbors. @ Lizzie, yes, no more years like 2018 (although my mom isn't going to last forever) but it won't be a shock. So sorry for the sudden loss of your mum. @Mary Ellen, exhausting is the perfect description. We try and try to do what's best and keep them happy but it just isn't enough. My mother would rant about my sisters stealing from her and strangers coming in the house to steal her money. Very unnerving. I hope your husband gets better soon. I'm glad you rescued the dog and the cat found you too. Sounds like a good match. @Stephanie, I actually started writing this post back in October and then the whole hospital stay and moving her to a new place happened and I got too busy. I had to change all of the verbs to past tense and add a few months of updates. I wish my mother had been willing to go to assisted living sooner when she was still able to enjoy activities and making new friends. She was very resistant to the idea even though she wanted to get out of the house more. It was sad because she really just wanted to be with her husband and that wasn't possible. In a way it is easier to visit her now because she doesn't remember anything and is delighted with simple things like a hug or her lunch. Another person letting you know you have been read and boy do I feel for you. I was so sorry to hear about Jimmy dog and really hopeful for Baloo being a good match for you. It is always added anxiety when a foster/rescue goes exceptionally not as planned. Man. Your mom. I just have to say as someone with experience volunteering in the field and really almost more for the caregivers I really feel for you. I am hoping she has a bit more contentment right now. OMG Daizy, it's so good to see you here again. I had stopped checking your blog very often after 6 months had passed without a trace of you. I can see how awful things had been getting when a dog peeing on your stuff seemed to be pretty far down on your list of problems. Reading about your mom's declining health makes me feel glad that my 88-year-old dad is still in good shape and has all his marbles. He did fall on his hip in 2017 and it needed replacement. But he was determined to resume his normal life which included bowling and fought hard through rehab and get back to the lanes in 2 months and is bowling great again. @thequiltingdoberman, hello! Baloo is doing well. Snoring on the floor at the moment. I'm still trying to get him to stop licking his front leg. The vet suggested lidocane but he licked it off. I bet his tongue is numb, lol. His collar is back on for now. My Mom seems to be settled at her home. With only 9 residents she gets more attention but it is difficult to find things to keep her occupied. I bought her a stuffed muff called a "Twiddle Muff" from Amazon. She fiddles with it for hours. I am trying to think if I can design a better product. She has managed to pull off all of the attachments. Maybe I can start a business selling them. There is definitely a need for them. @Dave, yes, the peeing dogs were the least of my worries, LOL. They were supposed to be the easy/fun part. I'm glad to hear your dad is still active. My mom will turn 79 this year. Still young compared to your dad.